There’s something really satisfying when you’re eating chewy, sticky rice cakes. 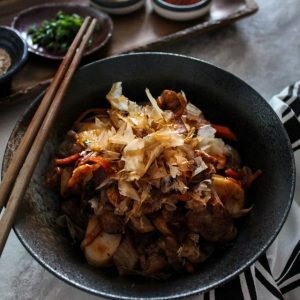 This kimchi rice cakes recipe is made with pork and kimchi, a classic combination packed with umami flavours. Bonus? It’s only uses 1 pan and it’s done in 15 minutes. Something I like to have around the house all the time is kimchi. It’s such a versatile ingredient that packs a strong flavour punch. Bonus is that it is also very healthy for you too. It’s made using lacto-fermentation which is a form of pickling that creates good bacteria and probiotics for your gut. If you have never had this before, and you don’t mind foods like sauerkraut then you should definitely try it! 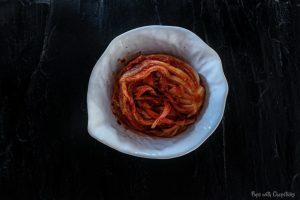 At its simplest form, kimchi is made with nappa cabbage, red chili pepper flakes, garlic and salt but there are many different types of kimchi and many ways to make it so you really need to try it a few times from different places to know what your preference is. As an ingredient, it goes really well in soups, stir-fries, sandwiches, noodles or just eat it as side dish like they commonly do in Korean cuisine. When you first try it, you might be surprised at the strong flavours it imparts. When I first tried it, it was the strong garlic flavour that was the kick in the face, but everyone has a different experience. Terry’s first experience was that he didn’t like the sourness of it (yet he likes pickles, go figure). The most predominant flavours I would say is the strong garlic flavour with a sour kick with a little spiciness to it. 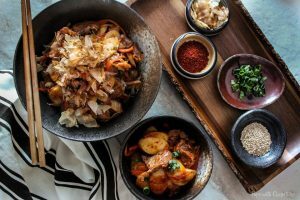 For this kimchi rice cake recipe, most of these ingredients will be found at your local Asian supermarket. This dish takes 15 minutes and you can switch out the protein as well. I usually just use leftovers. 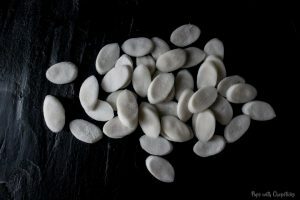 Traditionally, the more tubular shaped rice cakes are used in a dish like this but I prefer the rice cake slices since they are more bite-sized, less messy and easier to eat. Rice cakes are usually located in the freezer aisle but they can also be found in the fridge section as well. 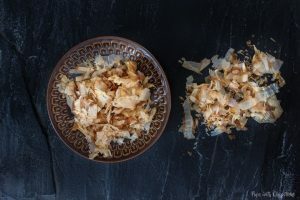 [optional] Bonito flakes are paper thin shavings of a fermented and smoked tuna that are high in umami and smoky flavours. They go great as a garnish on any kind of dish to give it a nice smoky flavour. I added in dashi powder to this dish for an additional smokiness and umami but that is completely optional. Slice the pork into bite-sized pieces, then put it in a bowl. Then add 1 tablespoon of soy sauce and let it marinate for a few minutes. In a separate bowl, combine the remaining soy sauce, mirin, sesame oil, water and the dashi powder together and set aside for later. Slice the carrots, onions and kimchi and set these aside as well. Put the rice cake in a strainer and run hot water through it for 1 minute. Pre-heat the pan on medium-high heat with a bit of oil and butter. I highly recommend a non-stick frying pan for this. Do not use a cast iron skillet pan for rice cakes. I found this out the hard way, and was left with a lot of goopy messes. When the oil is hot and the butter has melted, add the pork and stir-fry it for a few minutes until it has browned and caramelized. 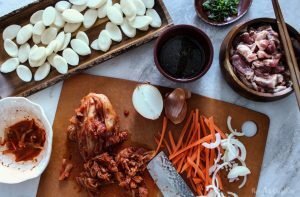 Now you can add in the the kimchi, carrots and onions and stir-fry it together for a few minutes. Lastly, add in the rice cakes and the sauce and cook until the rice cakes are chewy and soft. Voila! Garnish it with green onions, bonito flakes, or sesame seeds and enjoy! 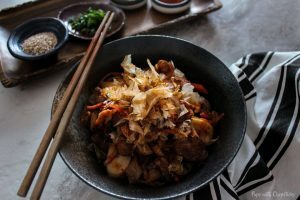 A quick and easy stir-fried kimchi rice cakes recipe that’s satisfyingly chewy and sticky packed with umami and smokey flavours. This recipe is a winner. I doubled the amount of rice cakes (felt like more was needed to make 3 main meals, it ended up making 4+), but kept everything else the same, and it was bloody awesome! This was my first time using rice cakes, and I’m tempted to make the half hour trip to the Korean store for the second time this weekend just so I can make this again asap. Aweeeesome! 🙂 So happy you liked it! Rice cakes are definitely one of my fave things to eat, isn’t the chewiness amaaazing? Buy a few packs (I assume you bought them frozen?) and store them in the freezer so you can have them anytime in a snap! That’s what I do! I store 3 packs in the freezer haha! 😀 and they last foreveeer in the freezer! Just tried this recipe and it’s sooo good! I think the addition of dashi really works here. The result reminds me a lot of the kimchi yaki udon dish that is common in Japanese izakayas! Hi Joyce. This dish looks so delicious! And it has interesting ingredients I haven’t tasted before so you have piqued my interest for sure. I love trying new things. Also, your photography is gorgeous! Your cooking with food technique is really amazing! I love the way you created the food like ingredients, food styles etc etc. 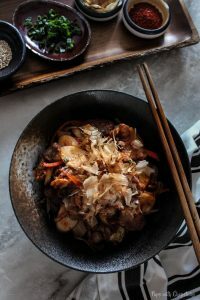 This time it’s the Kimchi stir mix with rice noodles is absolutely stunning, reason being the way you made the Kimchi ( I would have said is your fantastic homemade Kimchi !! I do believe you have put an outstanding effort into it — A STAR WINNER !! ) Because that your tasty Kimchi is very different from outside there. I’m a fancy Kimchi lover. I can tell that I would be obsessed to it. I would do follow your way to do it. Thanks. Thank you for your kind words. I am so glad you find my steps useful! 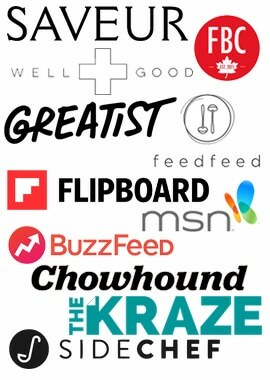 I am a very visual person myself so I like to see how things are done and the type of ingredients are used 🙂 and yes! I made the kimchi! I’m surprised you caught that! I REALLY need to get out of my comfort zone and give this recipe a try! Lol. The flavors sound fantastic. And I’m sure that if kimchi = garlic punch to face, then kimchi and I will get along great. I’ve actually never used dashi powder before . . . easy to find? You had me at 1 pan and 15 minutes! 🙂 I love kimchi and the addition of bonito flakes is amazing! i had some dukbokki (those korean rice cakes with spicy red sauce) yesterday, but was disappointed; it was just rice cakes, sauce and half a boiled egg for $7 (not to mention that there were only 14 rice cakes…). so now i’m craving rice cakes, and this sounds delicious! 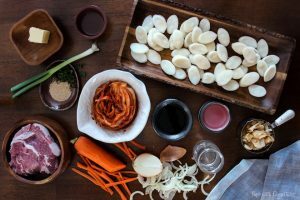 kimchi and bonito are some of my favorite ingredients, and i love that you combined them with rice cakes. Oh I never even thought of a boiled egg! haha I bet that’d go amazing with this quick meal! I love kimchi and always have a tub of it in the fridge. I like to eat it right out of the container like ice cream. And rice cakes…so delicious! You’ve got all the right things in this dish! I too, always have kimchi in my fridge! Its one of my favorite foods in the whole wide world, I absolutely love it! Now I have a new way to use it–this sounds amazing. 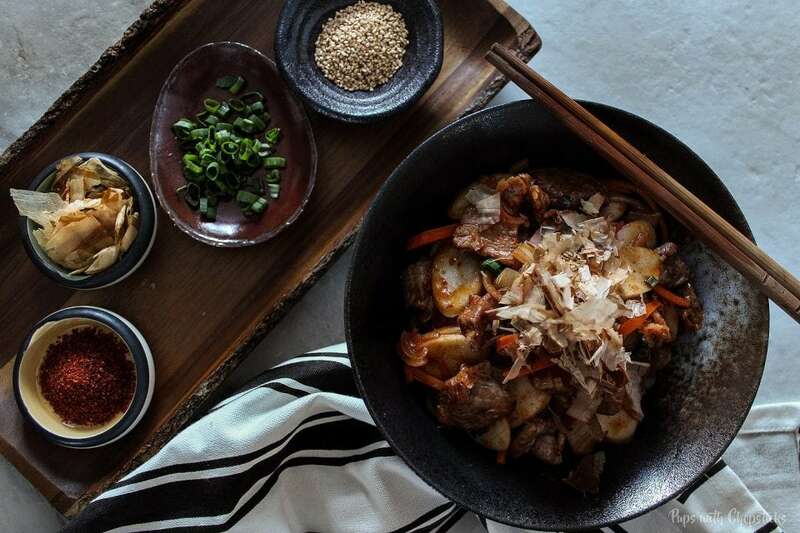 I love the korean japanese fusion going on in this dish (especially with the added bonito). Also I think using pork shoulder is a much better idea that loin. Lots of flavour going on here. I bet this would be awesome on top of stir-fried rice noodles as well if I don’t have time to grab the rice cakes. Thanks so much for your kind words! I definitely prefer the shoulder over any other cuts on the pork, so much flavour! Yes this would definitely be good with noodles, even rice!